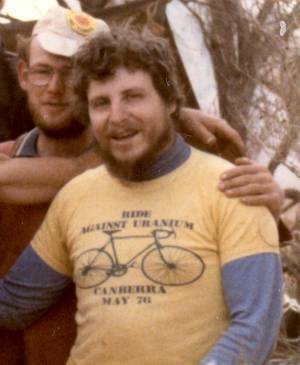 The Rides against Uranium in the late 1970s and early 1980s were important events in the campaign against uranium mining and in long distance cycle touring in Australia. There were few reports published on them at the time, and there is precious little written about them with an historical perspective and virtually nothing available on the internet as of June 2004. John Englart's personal accounts, photos and compilation of articles and newspaper accounts from the time provides a good subjective overview of the subject. The accounts by John here are a slightly expanded version of his article in the Friends of the Earth Australia book to mark the 30 year anniversary of FoE, 30 Years of Creative Resistance. 1975 Ride against Uranium. The first ride in May 1975 heralded the start of the campaign against Uranium mining. The first anti-uranium protest had ocurred in Melbourne in conjunction with the Ecology Conference held over Easter 1975 at Melbourne University. Now 150 cyclists had ridden to the nation's capital to tell the politicians 'No Uranium Mining' and to invest in alternative transport and renewable energy. 1976 Ride against Uranium. The second Ride against Uranium in May 1976 kept the spotlight on Uranium Mining with the new Fraser Liberal Government. 1977 Ride against Uranium. The third Ride against Uranium in May 1977 featured multiple routes, each independently organised and converging on Yass for the final ride to Canberra. 1981 Ride against Uranium. 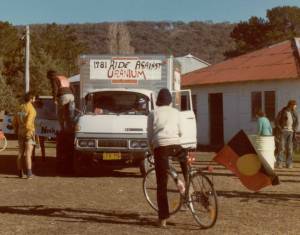 The Ride against Uranium in support of Trade Union Bans from Sydney to Canberra in May 1981. Atom Free Embassy. After its mysterious burning down outside the Lucas Heights Reactor, the Embassy was re-established by the Ride against Uranium on the lawns of Parliament House in 1981. 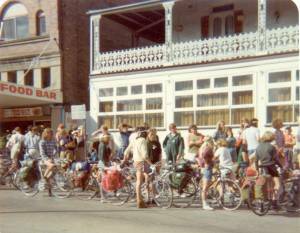 The World Bike Ride for a Nuclear Free Future left Canberra on March 6, 1982 with 50 cyclists to travel over 6,000km up the East Coast via Sydney, Brisbane, Townsville, and Mt Isa to Darwin. Five months later 44 cyclists rode in to Darwin. The ride continued through Asia and Japan and in Europe during 1982 and 1983. 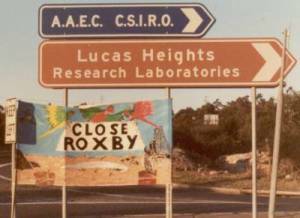 The Ride to Roxby 1984. A contingent of cyclists organised to ride 500 km from Broken Hill to Roxby Downs, meeting Adelaide cyclists midway, to join the Roxby Downs Uranium Mine blockade. Other anti-nuclear rides include Cycle Against the Nuclear Cycle from Melbourne to Jabiluka as part of the Jabiluka Blockade in 1998, and CANC2 from Darwin to Perth in 2000. Singing the anti-nuclear message. Some lyrics of songs learnt by participants on early rides against uranium. Historical impact of the rides against Uranium. Uranium Mining has not been stopped, but it is far more regulated with continuous public scrutiny, largely due to the campaign against Uranium Mining which the rides were an important part of. The rides also stimulated an interest in cycling, cycle touring and cycle protests over sustainable transport policies, which has been largely unacknowledged. Whether independently organised or under the aegis of an organisation like Friends of the Earth or Greenpeace, rides against uranium, or the nuclear cycle, continue to be held. In 1982 there were plans for a ride to the Honeymoon Uranium Mine near Broken Hill. In 1986 a ride was planned to go to Pine Gap military base near Alice springs to give one years notice of evication on 19th October. The ride was being organised by FoE Melbourne, Movement Against Uranium Mining in Sydney and Greenpeace in Adelaide. The Cycle against the Nuclear Cycle in 1998 provided cyclists the opportunity to travel from Melbourne via Adelaide to the Jabiluka Blockade in the Northern Territory. Cycle Against the Nuclear Cycle left from head office of North Ltd in Melbourne with about 15 cyclists on the 20th of June 1998. We were accompanied for the day, by many others cyclists who were unable to take time off to join the trip. From Melbourne we headed west through rural Victoria visiting small towns and running information stalls. In 2000 a further ride happened from Jabiluka/Darwin to Perth from the 5th June to 2nd September. It has taken us three months to cycle from Kakadu to Perth as the Cycle Against the Nuclear Cycle 2. We've had from 13 to 32 people of different ages and backgrounds travelling with us - although always a majority of women. We have visited local communities and the traditional owners of areas where mine sites are proposed where we held information stalls and listened to local concerns. We have been overwhelmed by the support and hospitality of local people and by the resistance they share to any involvement in the nuclear cycle. Thirty six of the forty three uranium mines proposed for Australia are in Western Australia, not in remote localities as we are led to believe, but in the backyards of active indigenous and white communities. Of major concern to these communities is the potential contamination of their ground water should mining proceed in their region. They also worry about the future health and safety risks of disturbing what has traditionally been treated as "sickness country". It was inspiring to carry messages of solidarity between these small communities who face the common menace of the nuclear threat. Read More on the Cycle Against the Nuclear Cycle II (CANC2) Website or visit Moz's CANC Stuff which documents the ride in journal entries and lots of photos. In 2007 further long distance anti-nuclear cycle touring is being organised by CANC via their website. Cycle Against the Nuclear Cycle (CANC) is a community campaign to raise awareness about and build opposition to the nuclear industry in Australia. We're converging on Canberra with pedal power to tell the pollies we don't want a nuclear future! We're cycling from Rockhampton to Canberra and from Port Augusta to Canberra from July to September to make Australia nuclear free. The anti-uranium bicycle rides were about providing an alternative vision. They were educative of both the participants and the people they met and intereacted with. And they were about people taking personal responsibility for their lives. They were both serious and fun. They were about living life and taking care of each other and the earth. Cycle touring changes you and your view of the world. A desert is barren and boring viewed from a car. But from a bicycle it is a continually changing landscape with always something new to see and experience. Those first FoE rides against uranium in the 1970s gave hundreds of cyclists the pleasure of experiencing the Australian countryside by bicycle. One of the few academic evaluations of the impact of the Rides Against Uranium is by Dr Sigrid McCausland in a paper on 'The rise of anti-uranium protest in Australia', a paper submitted to the refereed stream of the APSA Conference, October 2000. It is worthwhile quoting McCausland in full in regards to the impact of the Rides against Uranium. Two major events which quickened the pace of emerging opposition to uranium mining occurred in May 1975 -- the first FOE-organised bike ride to Canberra and the first national meeting of anti-nuclear groups. The bike ride provided, for the citizens of Canberra and numerous towns along the way from Sydney and Melbourne at least, a taste of protest action mingled with environmentalist fervour. It was to become an annual event for the next three years. The national meeting provided a sense of direction for the opposition and the hope of national coordination in what was acknowledged as a difficult struggle. The bike ride was preceded by several months of planning and involved some one hundred and fifty riders from Melbourne, Sydney and Adelaide. The choice of the bicycle was part of a wider critique of energy use (anti-fossil fuel and pro-solar) and public transport needs. The ride against uranium was described as "an opportunity to get together and do something while at the same time advancing a larger political objective". After up to ten days on the road, the riders staged a colourful and noisy entry into Canberra. On 20 May, the Minister for Environment was presented with a petition containing two thousand signatures and Parliament was interrupted by the unfurling of banners spelling "Ban Uranium" from the public gallery. The next day's activities included protest visits to the French and United States embassies, street theatre and a rally outside Parliament. One FOE report claimed several successes for the ride: it created publicity for the cause, for it had attracted media attention; it showed government leaders that there was a public campaign against uranium; and the riders, in making contact with country people along the way, had made many more people aware of the issue. 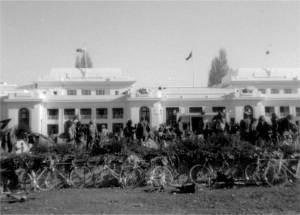 The bike ride and its variety of political and environmental activities was an early expression of the counter-cultural, anti-conformist dimension of the new style of anti-nuclear protest, something that was to remain a significant strand within the mass anti-uranium movement over the next few years. While McCausland assessed the rides in relation to the politics of uranium mining, the rides have had an equally important impact on cycle touring and cycling as a means of energy efficient and sustainable transport. The original Rides against Uranium left a legacy of interest in cycling and cycle touring. It gave many people, like myself, a first taste of cycle touring, with the next step being heading out on our own or with small groups of friends to see Australia or the world. The legacy of the Rides against Uranium is manifested in the non-political 'Great Victorian Bike Ride', first organised in 1984 by the Bicycle Institute of Victoria (now Bicycle Victoria) with 2,100 riders. Organisers now call it "the largest supported one-week bike ride in the world". These fully supported rides are now regularly booked out with up to 3,000 cyclists touring the Victorian countryside, and the associated complex logistics of moving the equivalent of a small town on wheels everyday. Similarly, the 'Sydney to the Gong' 93km one day bike ride was initiated by Warren Salomon, publisher of Freewheeling magazine, in 1982 with 240 riders and 25 support staff. It now attracts up to 10,000 entrants. The more political legacy has been manifested in a series of anti-nuclear rides which include the Ride to Roxby, the World Bike Ride, the Cycle against the Nuclear Cycle (CANC) to the Jabiluka Blockade in 1998, and the Cycle against the Nuclear Cycle II (CANC2) Darwin to Perth in 2000, and in various environmental rides. When the rides are smaller they are likely to be self-managed and non-heirarchically organised by the participants themselves. The alternative energy and sustainable transport message of the Rides against Uranium has also been taken up in Australian cities and some regional towns with the anarchic convergence of cyclists as critical mass during the 1990s under the slogan "One Less Car". The Critical Mass movement started in San Fransisco in 1992. Melbourne CM started in November 1995. Critical Mass in Melbourne continues to attract hundreds of cyclists on the last Friday of each month. Roads ordinarily denied to cyclists such as the Citylink Burnley Tunnel or the Bolte bridge have been ridden. Busy roads such as Punt Road, or Footscray road have been temporarily tamed. While critical mass cyclists are accused of blocking traffic, all too often the reality is the mass of cars, most containing only the driver, clogging city streets with their bulk and green house gas emissions. And impeding the smooth passage of hundreds of people on more ecologically friendly and sustainable transport: the bicycle. The Rides against Uranium would often bunch up into a mass just before riding into a regional town or city. There was safety in numbers and it created greater visibility, and a greater impression and publicity. As cyclists we become visible as a mass: whether it be on an organised fully supported bike tour, or as a group of friends riding in support of a particular isssue, or just as "one less car" in critical mass. Governments and urban planners still only give token support to the bicycle as a transportation system (as against a recreation). With rising petrol prices due to the approach of peak oil more people will be turning away from car culture to the humble bicycle and public transport to get around. The need for sustainable energy sources and transport systems is now more than ever apparent. The Rides against Uranium should be remembered for stimulating the campaign against Uranium Mining at a crucial time, but also for stimulating interest in alternate energy systems, and especially the humble bicycle as a method of sustainable transport. John is a community activist, a long time member of FoE, and has been involved as a cyclist since the mid 1970s, commuting to work, participating and supporting anti-nuclear campaigns and bike rides, amoung many other activities. Bicycle Federation of Australia. All the main state bicycle advocacy organisations are linked from here with the exception of Bicycle Victoria. © Takver. All Rights reserved except for nonprofit, union or educational use, please credit source.